Senior visitors to Hong Kong are able to enjoy generous discounts on fares for most public transport. Concessionary fares apply mostly at age 65 although some operators offer senior fares at age 60. Since the introduction of the government's "Public Transport Fare Concession Scheme for the Elderly and Eligible Persons with Disabilities" in three phases between June 2012 and March 2013, senior fares for most MTR journeys, bus routes and domestic ferry services are a maximum of HK$2 journey when paid with Elder Octopus Card. The scheme was extended to include 407 Public Light Bus (green minibus) routes from 29th March 2015 and as at April 2017 the number of green minibus routes included in the scheme stands at 522 routes served by 159 operators. Foreign elderly visitors to Hong Kong are able to enjoy the same HK$2 concessionary fares as locals in respect of the "Public Transport Fare Concession Scheme for the Elderly and Eligible Persons with Disabilities" although foreign disabled persons are not able to enjoy these concessions. Where the original fare is less than HK$2, the original fare applies. Payment must be made with Elder Octopus Card to benefit from the HK$2 government-sponsored concessionary fare, by which the government subsidises the difference between the transport operators own concessionary fare for elders and the HK$2 fare. Without Elder Octopus Card, foreign elderly visitors can still obtain concessionary fares either by purchasing single-journey tickets for MTR journeys or paying in cash, or where applicable, buying tickets for bus and ferry journeys. However, the transport operators own concessionary fare is usually limited to 50% of normal adult fare. The most convenient method for visitors to enjoy concessionary fares on public transport is to obtain the On-Loan Elder Octopus Card. The card functions in the same way as the adult on-loan Octopus Card but is programmed to automatically deduct the concessionary senior fare for each journey where one is available. If no concessionary is available the full adult fare is deducted. Octopus Cards can be used on all transportation detailed below except ferry services to Macau. In addition to the benefits the Octopus Card provides in terms of convenience and lower fares on MTR journeys compared to purchasing single-journey tickets holders of the Elder Octopus Card currently also enjoy additional privileges such as a special concessionary fare of just HK$2 for each journey on most public transport including MTR, buses, trams domestic ferries and, from early 2015, green minibus (see below). The On-Loan Elder Octopus Card can be obtained at the airport at the Airport Express Customer Service Centres in the "buffer hall" (after immigration but before entering the arrival hall), in the arrival hall itself and on the Airport Express departure platform, at any MTR Station Customer Service Centre, New World First Ferry Octopus Customer Service Centres at Central Piers 5 & 6, New World First Bus Customer Service Centre at Admiralty (East) Bus Station, KMB Customer Service Centre at Sha Tin Central Bus Station and at MTR Light Rail stations. The On-Loan Elder Octopus Card costs HK$70 of which HK$50 is a deposit for the card and HK$20 is the stored useable value. 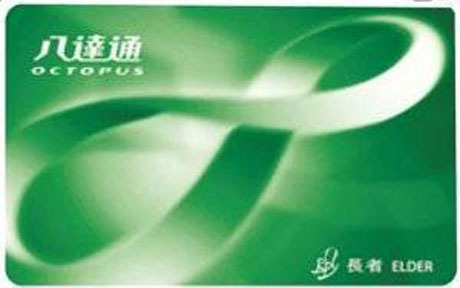 The card can be topped up as necessary in the same way as the adult on-loan Octopus Card and before leaving Hong Kong visitors can obtain a refund of any remaining balance on the card and the deposit (less HK$9 admin fee) by handing the card in at either of the Airport Express Customer Services at the airport or at any of the other points mentioned above at which Octopus Card can be purchased. No personal identification or proof of age is required to obtain the On-Loan Elder Octopus Card and no personal information is recorded or stored on the card, which is transferrable. However, uniformed staff of transport operators can demand production of personal ID and Elder Octopus Card on request. Visitors intending to return to Hong Kong in the near future should note the card remains active for a period of 1000 days from date value was last added (top-up). After 1000 days, the card can be reactivated at any MTR station customer service centre. MTR TRAINS. Age 65, HK$2 per journey when fare paid with Elder Octopus Card only (but not Airport Express journeys, journeys on East Rail which terminate at, or start from the mainland border stations of Lo Wu and Lok Ma Chau, first-class journeys on East Rail or East Rail journeys to Racecourse Station). Where the original fare is less than HK$2, the original fare applies. Where Elder Octopus Card is not used (ie concessionary single-journey tickets obtained), half-fare applies. MTR LIGHT RAIL. Age 65, HK$2 per journey when paid with Elder Octopus Card. Where the original fare is less than HK$2, the original fare applies. Where Elder Octopus Card is not used (ie concessionary single-journey tickets obtained), half-fare applies. LONG WIN BUS CO bus routes (including “Airbus” routes to/from airport). Age 65 half-fare. Max HK$2 fare applies to each journey when fare paid by Elder Octopus Card (but not A-prefix airport routes). CITYBUS (including “Cityflyer” routes to/from airport). Senior (half-fare) fares apply at age 60 on most Citybus Hong Kong Island routes, but not jointly operated cross-harbour routes. Senior concession applies at 65 on other Citybus routes, mainly jointly-operated cross-harbour routes, and airport routes. There are no senior concessions on Citybus "Citytours" open-top bus tour. Max HK$2 fare applies each journey to all Citybus journeys for passengers age 65 when fare paid by Elder Octopus Card, except "A" prefix airport routes and racecourse routes. Where concessionary fares are available at age 60, visitors age 60-64 wishing to take advantage of such fares who have reached age 60 but not age 65 must not use Elder Octopus Card and must pay (exact) fare in cash or by Personalised Octopus Card which stores the users age in order to obtain concessionary fares at age 60. However, as Personalised Octopus Card takes 10 days to obtain from date of application it is not suitable for most visitors. A Sunday and public holiday maximum HK$2 concessionary fare scheme which was in force before the Government's Public Transport Concessionary Fare Scheme was introduced in 2012 continues to operate for passengers age 60-64 on Citybus Hong Kong Island routes and Shenzhen West Express routes (excluding cross-harbour routes and Racecourse routes) but, since August 26th 2012, Personalised Octopus Card is the only form of transaction accepted to enjoy this concession. NEW WORLD FIRST BUS (NWFB). Age 65 half-fare. Max HK$2 fare each journey applies when fare paid with Elder Octopus Card. NEW LANTAO BUS CO. Age 65. Concessionary fare varies by route. Max HK$2 fare each journey applies when paid with Elder Octopus Card except airport route A35 and routes on a pre-booking and group hire basis. MTR BUS. (operate in Northwest New Territories only - feeder services to MTR and MTR Light Rail Stations). Age 65 half-fare. Max HK$2 per journey when paid with Elder Octopus Card. DISCOVERY BAY TRANSPORTATION SERVICES. Age 65 half-fare (bus services to/from Discovery Bay and Sunny Bay and Tung Chung. No senior concessions in respect of services between Discovery Bay and Hong Kong International Airport. PARK ISLAND TRANSPORT COMPANY. Age 65 half-fare on night bus (ferry replacement) service between Ma Wan and Central Pier 2. No concessions on other services to/from Ma Wan and Tsing Yi Station, Tsuen Wan Station, Kwai Fong and Hong Kong International Airport. Senior concessions (half-fare) are offered by individual operators on most GREEN MINIBUS routes at age 65. RED MINIBUS fares are unregulated and although some operators may allow senior discounts this is discretionary. NEW WORLD FIRST FERRY (ferry services from Central Piers, Hong Kong Island to/from Cheung Chau and Mui Wo, Lantau Island, Inter-Island ferry service between Cheung Chau, Mui Wo and Peng Chau and cross-harbour services between North Point and Hung Hom and North Point and Kowloon City). Age 65 half-fare. Max HK$2 per journey when paid with Elder Octopus Card, but excluding de-luxe class cabin (Cheung Chau and Mui Wo services). HONG KONG & KOWLOON FERRY (HKKF) (ferry services from Central Piers, Hong Kong Island to/from Lamma Island and Peng Chau). Age 65 and over half-fare. Max HK$2 per journey when paid with Elder Octopus Card. STAR FERRY (cross-harbour routes between Hong Kong Island and Kowloon. Free for both local and visiting seniors age 65 on production of Senior Citizen Card or HKID card or by using Elder Octopus Card. Otherwise full adult fare applies. On Star Ferry Harbour Tours a discount of about 10% applies at age 65. DISCOVERY BAY TRANSPORTATION SERVICES (ferry services between Discovery Bay and Central Piers, Hong Kong Island). Age 65 half-fare but full night surcharge applies on ferry services between midnight and 6am. Max HK$2 per journey when paid with Elder Octopus Card. PARK ISLAND TRANSPORT COMPANY (ferry services between Park Island, Ma Wan and Central Pier 2, Hong Kong Island). Age 65 half-fare. Max HK$2 per journey when paid with Elder Octopus Card. TSUI WAH FERRY (ferry services between Aberdeen, Pak Kok Tsuen and Yung Shue Wan). Age 65 half-fare. Max HK$2 per journey when paid with Elder Octopus Card. FORTUNE FERRY (ferry services between North Point/Kwun Tong and Tuen Mun/Tung Chung/Sha Lo Wan/Tai O). No concessionary fare without Elder Octopus Card. Max HK$2 per journey when paid with Elder Octopus Card. CORAL SEA FERRY (ferry services between Sai Wan Ho/Kwun Tong, Sai Wan Ho/Sam Ka Tsuen and Peng Chau/Hei Ling Chau). Age 65 half-fare. Max HK$2 per journey when paid with Elder Octopus Card. CHEUN KEE FERRY (ferry services between Aberdeen, Mo Tat and Sok Kwu Wan). Age 65, approx 25% discount from adult fare. Max HK$2 per journey when paid with Elder Octopus Card. MARIS FERRY SERVICE LIMITED (ferry services between Cheung Chau and Aberdeen). Max HK$2 per journey when paid with Elder Octopus Card, otherwise no senior concession. TURBOJET (ferry services between Hong Kong and Macau). Age 65 HK$15 discount on economy tickets. No senior discounts on Premier Jetfoil journeys and no senior discounts on TurboJet Sea Express services between Hong Kong International Airport and Macau. Octopus Card not accepted. COTAI WATER JET (ferry services between Hong Kong and Macau). Age 60 HK$15 discount per ticket but not on HK International Airport/Macau route. Octopus Card accepted at Hong Kong Terminal only. THE HONG KONG OBSERVATION WHEEL (at age 65). The following museums which make an admission charge offer discounted admission (usually 50%) for seniors (both local and visitors). *These museums currently offer free admission to their permanent exhibitions for all on Wednesdays. The following museums offer free admission for all on every opening day for all. From 1st August 2016 admission to Hong Kong Heritage Museum, Hong Kong Museum of Art, Hong Kong Museum of History, Hong Kong Museum of Coastal Defence and Dr Sun Yat-sen Museum, which were previously fee-charging museums (except on Wednesdays) is free to all every opening day.